Hello We R Fans! Kimberly here with fun, festive, and handmade cards for the holidays! Everyone loves to make (and get) a handmade card in the mail, but during the holidays, our time is at a premium. Once again, We R Memory Keepers is bringing us a tool that saves time and makes us look good! 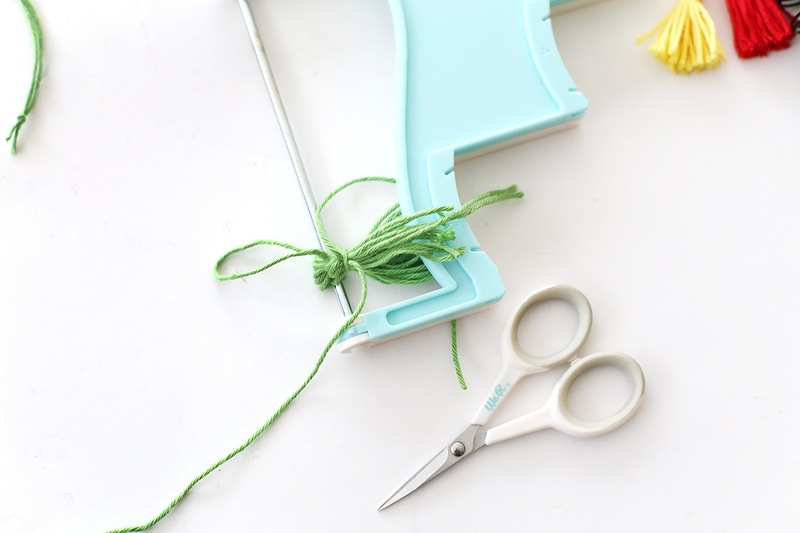 The Circle Spin & Trim is a tool that makes creating circles of just about any size a snap! Smooth and easy to use, check out how I used it on these ornament cards. Making these cards took so little time. And how cute are they? Not your everyday Christmas card, that is for sure! The blades for the Circle Spin & Trim sit in the top of the tool. Love the on-board storage and the fact that there are two blades! To cut, one blade easily twists into the guides on the center of the tool. You can choose from so many different sizes! After the blade is inserted, place your paper inside the Circle Spin & Trim. Firmly close the lid. See the piece that looks like a “Sorry” game board piece? It’s the handle. Simply turn the handle and it will cut your circle. I cut out circles from green, red, aqua, and pink cardstock. Two for each card-for a front and back. On one set of circles, I stamped and heat embossed the word joy. On the others, I added layers of stripes, created with white cardstock. To make the ornament hanger, I trimmed silver glitter cardstock to size. (approximately 1” x 1”) I scored each piece of glitter cardstock in half, adhering one side to each piece of cardstock. To have a place to “hang” the ornament from, I used my We R Memory Keepers Reinforcer Hole Punch. Punching the rings from the same silver glitter cardstock. Each ring was glued to the top, as shown. On the inside of each card, I added another circle, one that was the next size smaller. Look at that perfect layering! Yay! The circle gave me a place to write some quick words. After making these, I had so many more ideas! 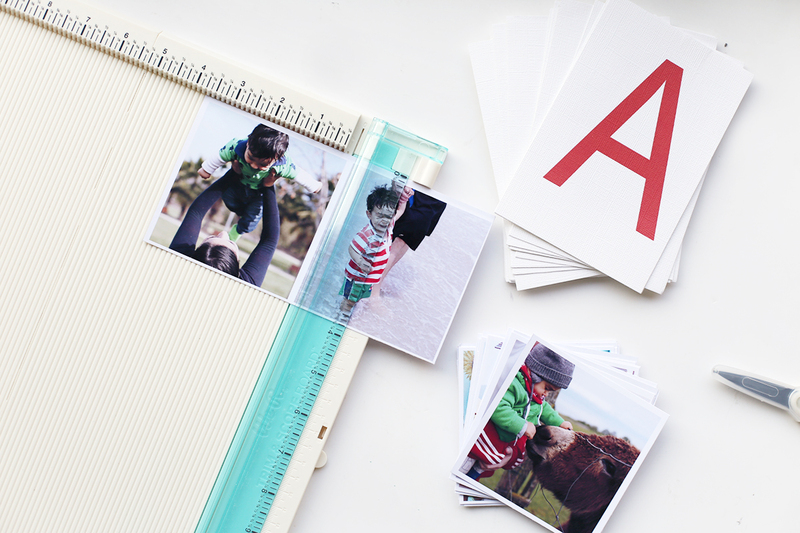 Wouldn’t it be cute to place a photo on the inside, above the writing? Oooh, and these would make adorable tags on Christmas gifts. Or just to use as ornaments themselves! What will you make with your Circle Spin & Trim? Hello everyone and welcome to the We R blog! 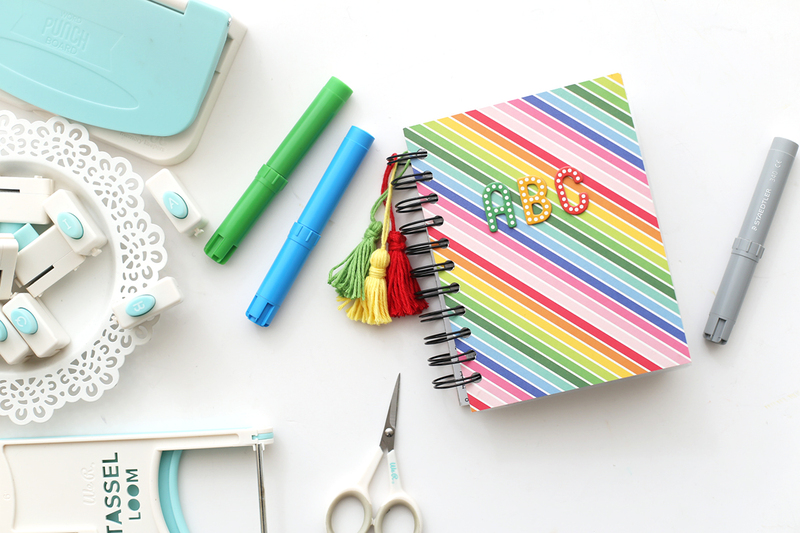 It’s Eva Pizarro here today sharing a tutorial on how to make a Personalized ABC Book using the Word Punch Board and the waterfall sleeves. 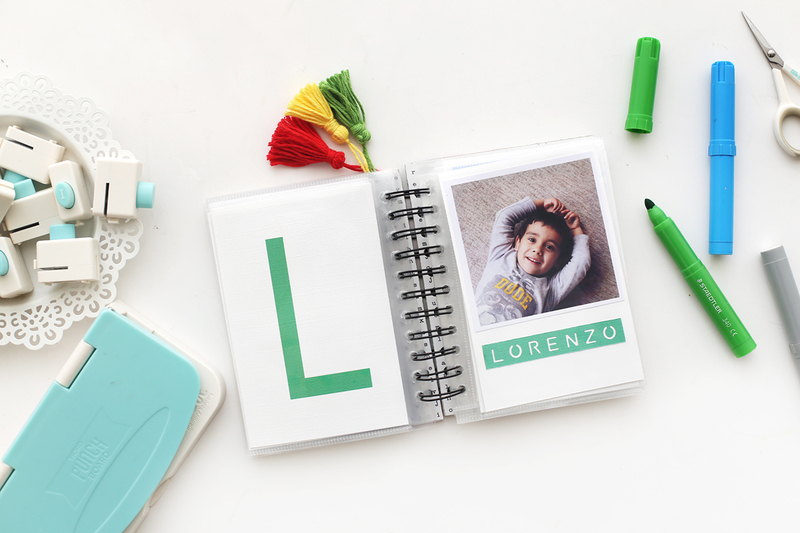 My little toddler started school this year and he has been learning letters and how to write his own name so I thought it would be fun to create an ABC book with some photos of some of his favorite things! I started by using my Trim and Score Board to cut 4×6 letters and 28 3,5 inch square pictures, one for each letter. 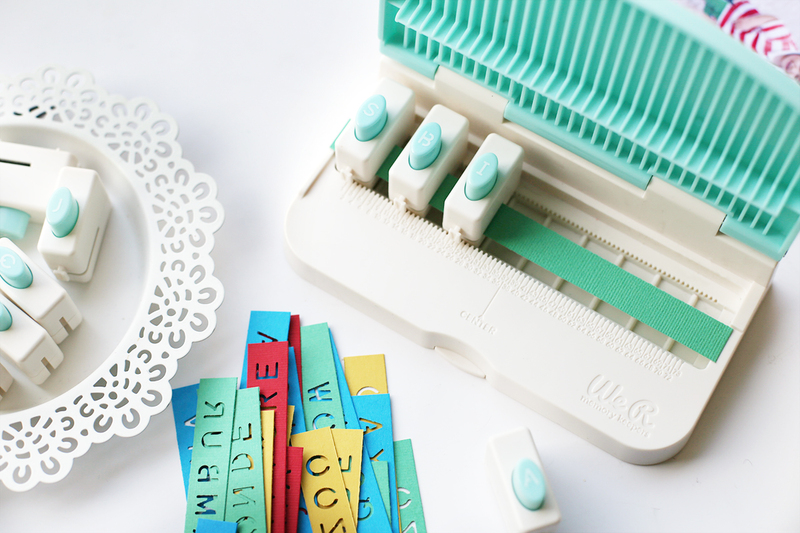 Next, I used my Word punch Board to create all the words for the mini book. Because I wanted the letter to be closer together I punched the odd letters first placing the punches on the 1,13,25 and 37 marks. Then I changed to the even letters and placed my punches on the 7, 19, 31 and 43 marks. On each page I included the letter, a picture and a punched word. I placed each page on the 4×6 inch Waterfall Sleeves, they are plastic so my son can practice the letters on top and then clean everything with a tissue. He couldn’t wait to try the book! I made some cardboard covers and bound everything with my Cinch. 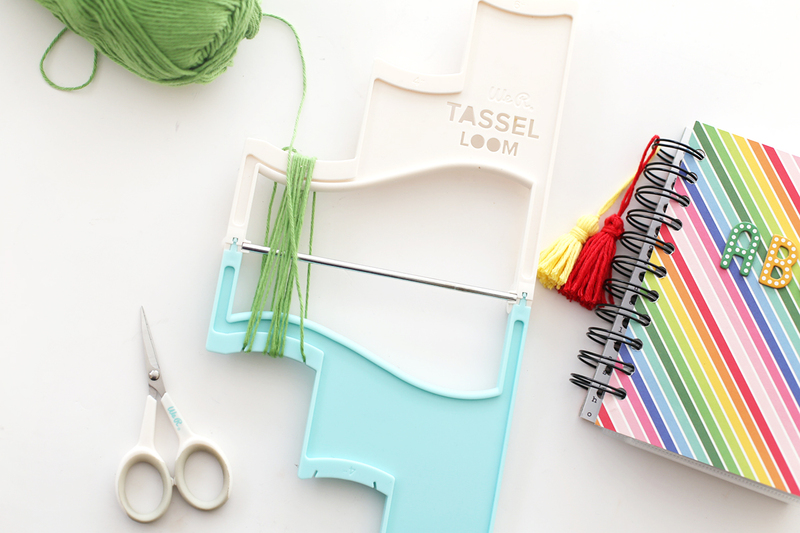 To decorate the mini book I used my Tassel Loom to create coordinating tassels. They were very easy to make! 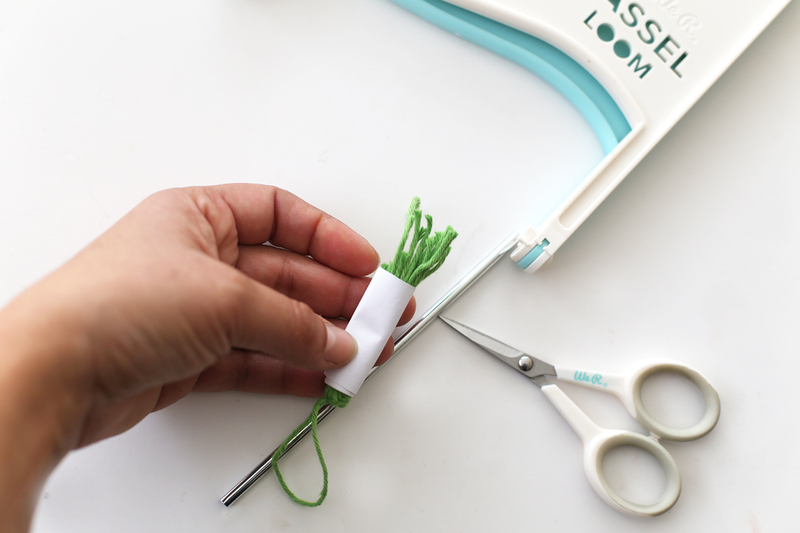 The Tassel Loom makes 3 different tassel sizes and it is foldable so you can easily store it and take it to crops. Once you remove your tassel you will need to trim it. 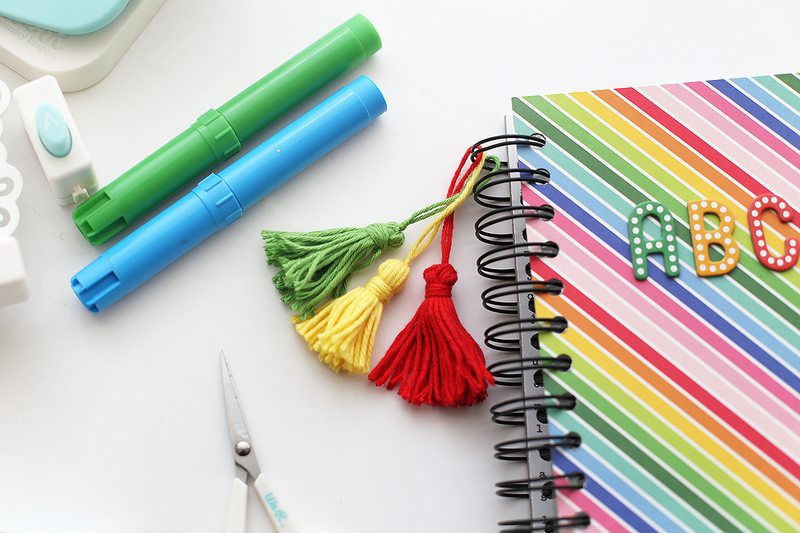 Simply wrap your tassel on paper and cut the border! Aren’t those tassels cute? 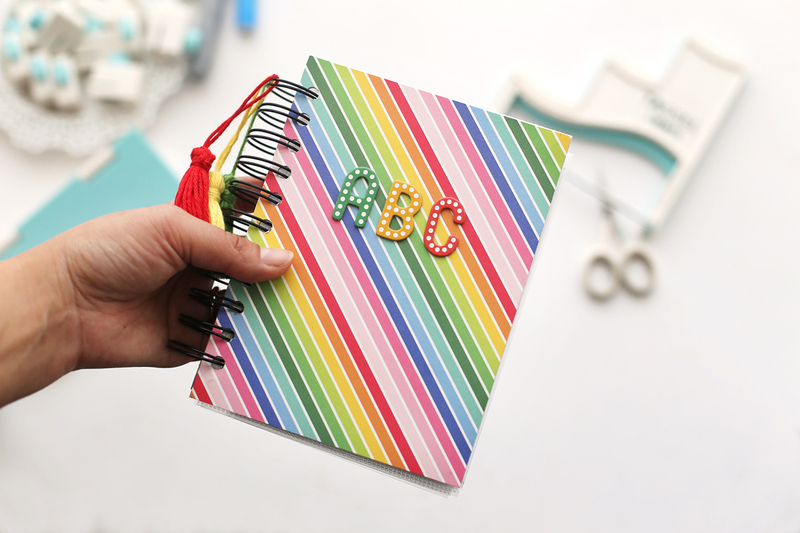 They are perfect to decorate mini books! The cover is super simple because I know my son is going to use this book all the time! A few thickers and that’s it! 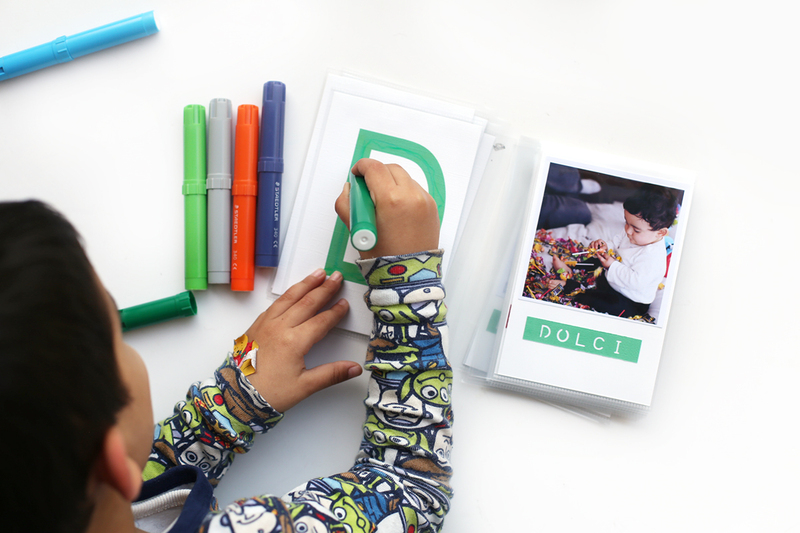 The lovely cover paper is from My Bright Life collection by Pebbles Inc.
My son is really excited about his book and I love that he can practice letters in a fun and cute way! 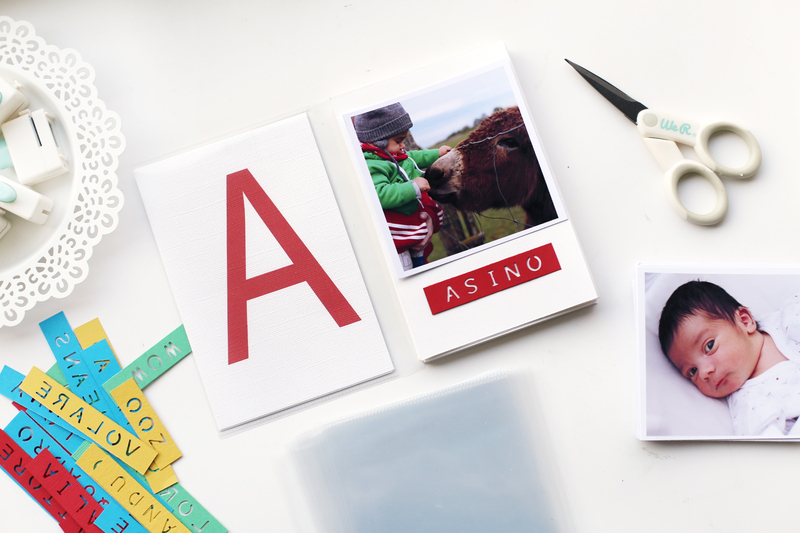 Have you ever made an ABC book? I think it is the perfect gift for a small children! Hello, We R friends, Laura here today! I am sharing a fun card set I made with some of my current favorite colors – teal, blue, and pink. I think this color combination is so fun and the adorable Pink Paislee Wild Child Girl collection is perfect for this color theme. To make each card base I started by trimming a 12” x 12” piece of paper to 6” x 8” using the Trim & Score board. I scored the long side at 4” to easily be able to fold the card in half. This will make a card with a finished size of 4” x 6”. To embellish the first card, I trimmed teal heart patterned paper from the Wild Child paper pad to fit on the card. I also trimmed a blue and a pink sheet of cardstock to 1 ¾” and then used the banner punch board to create flag shaped banner pieces. I used the word punch board to spell out the word HELLO on a pretty floral paper. I used an extra piece of the blue cardstock behind the word so that the word showed up better on the card. I trimmed each end of the word with a v shape to mimic the banner pieces I already made. I attached the hello sentiment to the top of the banner pieces. I started creating the second card in the same way as I did for the first. I cut a piece of patterned guitar paper to fit on the card base. Then, I used the square punch board to create three mats for this cute cool cat die cut. The square punch board makes it so easy to cut perfectly sized squares and rectangles in so many sizes. I added some twine around the patterned paper that reminded me a little bit of the guitar strings, and then added the guitar die cut using adhesive foam dots. For the final card, I only used the Trim & Score board. I created the card base from teal cardstock. I added a teal and blue floral paper to the front of the card. I also added a blue cardstock strip along the bottom third of the card. I found a pink tag from the Wild Child ephemera set and added some twine to embellish the top. Then, I attached a floral die cut using foam adhesive dots to give the card a little dimension. I love this color combination of the teal, pink, and blue for these cards. They would be the perfect little set to give as a gift. 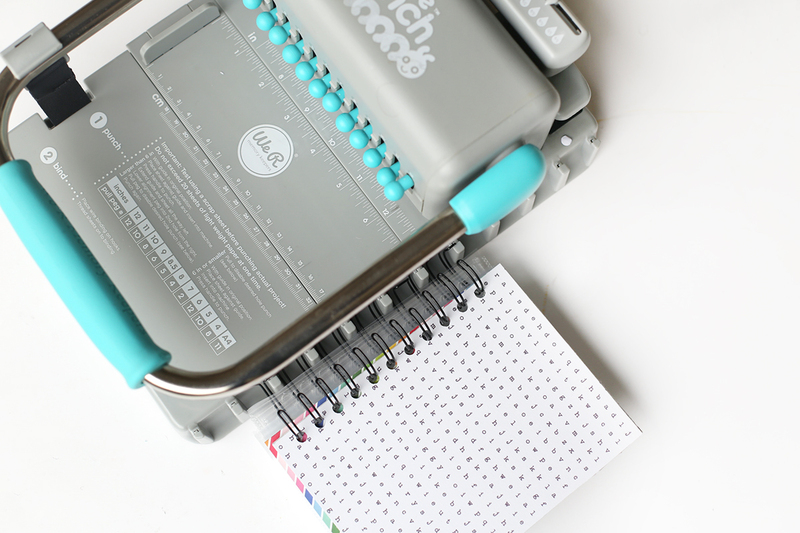 You could even make coordinating envelopes to go with them using the envelope punch board! What is your favorite color combination?